Have any of you seen the latest Louis Vuitton Ad? In case you haven't, here it is. Louis Vuitton reaches for the heavens in a new print ad starring astronauts Buzz Aldrin (Apollo 11, first steps on the moon in 1969), Sally Ride (First American Woman in space) and Jim Lovell (Apollo 13, commander). 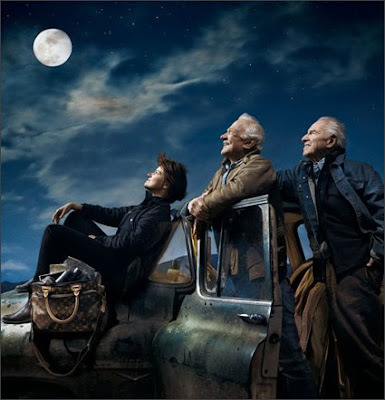 The three appear in this photo, shot by Annie Leibovitz, sitting on the hood of an old truck, gazing up at the moon, on which Aldrin walked 40 years ago this past July 20th. There will also be a companion video in which the three reminisce about their space travels. (Neil Armstrong, the first man on the moon, apparently declined to be involved.) The handbag featured in this campaign is the Icare travel bag, which goes for $1,530. It's nice to see some different faces other than celebs for a change...don't cha think? wow, Annie Leibovitz is such an amazing photographer. Her pictures almost looks surreal. I love the direction LV went with this.